Home Giving What Makes You Happy? 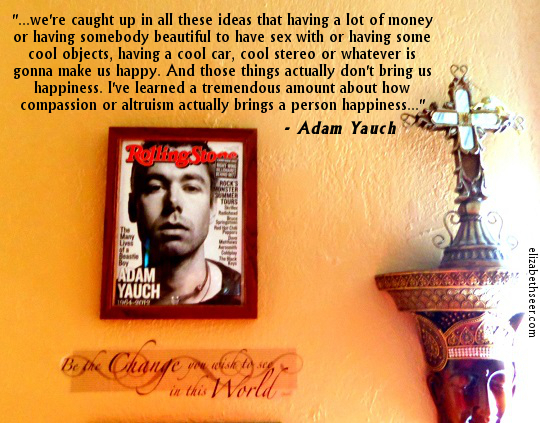 I was listening to the Beastie Boys today, pondering the life of Adam Yauch. He was a Catholic/Jew, turned Tibetan Buddhist. I have his Rolling Stone magazine cover framed on my wall just above the famous Gandhi quote about being the change you wish to see in the world. Today’s meditation meme is all about thinking on where you find your happiness. He is absolutely correct in knowing that “stuff” will not bring happiness. I worked for an incredibly wealthy, terribly unhappy woman. She was bereft of spirit and tried to shop to fill the sucking black hole in her soul. Compassion and giving of yourself is where true fulfillment and happiness reign. The great ones know this, and I hope to see the world filled with greatness as every person reaches this understanding. be happy, habits of happy people, happy habits, happy helping, happy people, happy success, true happiness. Bookmark.